The Anesthesia Closed Claims Project was initiated in 1984 by the American Society of Anesthesiologists (ASA) to analyze closed malpractice claims and improve patient safety. 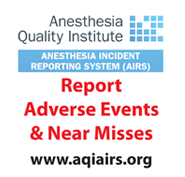 The goal of the Anesthesia Closed Claims Project is to identify major safety concerns, patterns of injury and strategies for prevention for anesthesiologists working in pain management, operating rooms, labor floor, remote locations and critical care. Data is gathered in the form of detailed case summaries collected by ASA member anesthesiologists from malpractice insurance organization claim files. The data includes a detailed narrative summary of each claim, describing the sequence of events and pertinent positives and negatives in the clinical sequence of care. Dissemination of study results is broad and includes publication in scientific literature, the ASA newsletter, as well as presentations at national and international meetings. Access to categories of publications from the project can be accessed here. The Closed Claims Project studies events that are rare and serious sentinel events. Continual vigilance in studying these events contributes to ensuring the safe delivery of anesthesia and securing the future for the specialty. This project, along with the other AQI registries, positions the ASA as a world leader in improving health through innovation in quality and safety. A formal data use agreement/policy is in development for the closed claims data by the AQI Closed Claims Committee. Data use requests are on hold during the development of the policy. Upon policy acceptance, information for submitting a request will be provided via the AQI website.